Culture Whisper (★★★★★) was elated that the season-opener, the new production of La rondine, ‘illustrates to perfection what OHP does best’, adding that ‘in many ways the night belongs to conductor Matthew Kofi Waldren, spinning a sparkling City of London Sinfonia like a top’. The Guardian (★★★★) also showed admiration for ‘the City of London Sinfonia – brass especially – spirited and infectiously enthusiastic’. WhatsOnStage (★★★★) crowned La rondine ‘a visual and musical feast’, and gave praise to ‘the ever-splendid City of London Sinfonia, whose annual residence is one of the company’s outstanding boasts, [who] played the score for all its worth under Matthew Kofi Waldren’s elegantly energised baton’, while the Daily Mail (★★★★) didn’t ‘expect to see anything much better this summer’. With the ‘gem-like orchestral colours’ (The Arts Desk) of La rondine, and a ‘great deal of musical panache’ (Limelight) in Don Giovanni, the Opera Holland Park 2017 Season has sailed to critical acclaim. City of London Sinfonia will be back in the Opera Holland Park pit in Kát’a Kabanová (starts 15 July) and Zazà (starts 18 July). 2015 marks City of London Sinfonia’s twelfth year as Orchestra-in-Residence at Opera Holland Park, and we’re very sad that it all came to an end this weekend. In celebration of our collaboration with the festival, we caught up with one of our long-standing members, Mark Paine who has been with us from the very beginning. We can’t believe it’s been 12 years since our (and your!) first production with OHP! What has been your favourite show over the years? Yes this 2015 season is my twelfth at Opera Holland Park with CLS. I played in the orchestra’s first season back in 2004, starting with Bellini’s Norma, and I have played nearly every opera each summer since then. That makes 64 operas, averaging let’s say eight performances… bringing me to over 500 shows! Definitely a record of some sort. And it has been an absolute privilege and pleasure! I have been a part of some of the best music- and drama-making anywhere, and have been made, by the inspired owners James and Mike, to feel welcome at the very heart of the Opera Holland Park family. With 64 productions to choose from how can I single out one? If pushed I would have to say Janáček’s Káťa Kabanová back in 2009. But there are so many others I could mention. All of them have been in some way incredibly special, even ground-breaking. From an orchestral musician’s perspective, what is the difference between performing on stage as part of a concert and in the pit as part of an opera? Over the years I’ve been doing it, Opera Holland Park’s speciality has become the so-called verismo operas that burst while hot onto the Italian operatic scene in the early 20th century. Treading where no other opera company dares, OHP has unleashed onto the UK opera world six or so of these terrifying and unforgettable operas, to great acclaim. It has been wonderful to be a part CLS’s commitment to these spectacular undertakings, and literally to feel every one of us giving that little bit more, responding to the artistic challenge. CLS has matured as an orchestra by so doing. What advice would you give to a CLS member who is embarking on their first production at OHP? My advice to a CLS member embarking on their first production at OHP would be to take it incredibly seriously, to give it your absolute maximum. The rewards are rich and our contribution is noted and valued. It’s not just a lovely place to be on a summer’s eve; it’s something quite unique both professionally and personally. 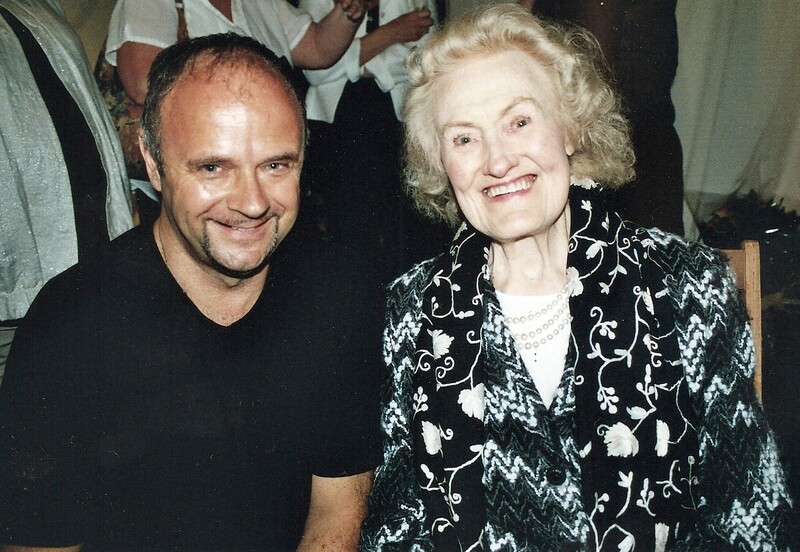 My abiding memory of OHP… getting to meet the late Dame Joan Sutherland, who attended on crutches a performance that Richard Bonynge was conducting for OHP. I have been a fan of hers forever, and I managed to get some private time with her at the post-opera party. Desperate to talk to her about her legendary Lucia di Lammermoor triumphs, I had instead to let her tell me all about her beloved vegetable patch into which she had just fallen and broken both legs. But do you know it turned out better than I could have imagined – I got the true Joan, and a wonderful photo to treasure. Thank you OHP for everything. With only a few final performances to go, Opera Holland Park is nearly over for another year and so our Concert Management team must move on to new (probably indoor and peacock-lacking) endeavours. But what exactly did they see and do during their time there? Watching a vertically-challenged Minute Maestro conduct the Orchestra at the Opera Holland Park Family Open Day. Pumping up the harp trolley’s flat tyres. Luckily, most of our French Horn players are keen cyclists, and Chris Newport had a bike pump handy, making the job a lot easier. Is it a tuba? A trombone? No, this is Stephen Wick playing a cimbasso in rehearsal ready for Bellini’s Norma! Sharing is caring for CLS & OHP behind the scenes! One of the musicians brought in some aubergine plants – needless to say, they were taken up very quickly! Ever wondered what it’s like to work as a musician at Opera Holland Park? As Orchestra-in-Residence for the 11th year this year, we thought we’d give our lovely readers a teeny insight into the ‘orchestral life’ at this fantastic outdoor summer opera festival. With biscuits, gun shots, evening chills and more, we caught up with one of our longstanding members, Mark Paine (Horn) who told us some of his favourite memories and moments of his experience during his time in the OHP pit over the years (just to clarify, by ‘pit’ we mean the orchestral variety – not a muddy hole in the ground). How long have you been playing at Opera Holland Park? I think this is my 11th season can you believe! Well, ever since CLS first started doing it. And what’s been your favourite opera? Of course, everyone will say this – it’s terribly difficult to say. But my most memorable, and therefore favourite, has got to be L’amore dei tre re which we did with Peter Robinson. Without interval, it was a continuous crescendo from beginning to end and I guarantee you nobody took a breath in the audience until the final gun shot which finished it. It was just amazing. I hear biscuits are essential for any performance at Opera Holland Park. How many packets of biscuits do you think the Orchestra have consumed so far this season? Shopping trip for biscuits for OHP! What makes performing at OHP different to other opera houses or opera companies that you’ve worked with? Oh, a million things. The peacocks, the sub-zero temperature… It really is very, very special. It’s a combination of so many things. Great music, great operas, interesting repertoire and such engaged producers as James Clutton and Sarah Crabtree. It’s a fantastic company and a unique experience which is why I make sure I come back every season. The summer months mean one thing and one thing only here at the City of London Sinfonia: Opera Holland Park! Marking our 11th consecutive year as orchestra-in-residence at “London’s Glydebourne”, this year’s season has got to be one of the finest. With so many fantastic productions to choose from –Britten’s haunting Turn of the Screw, Rossini’s ever-popular comedy La Barbiere di Siviglia and Bellini’s wonderful Norma…– and all amidst the leafy glades one of the most beautiful parks in West London, we couldn’t recommend the festival enough, even if only to witness the resident peacocks cooing along to the catchiest of arias or the tent-like theatre built upon the fragmentary ruins of Holland House. Really enjoyed #OHPFanciulla last night esp Minnie's entrance! Wow! #smokin! #OHPBarbiere really cheered me up, great fun! #thanks @operahollandpk for a lovely evening! All photos taken by Fritz Curzon, photographer-in-residence at Opera Holland Park. 1. Falstaff is adapted from Shakespeare’s The Merry Wives of Windsor and scenes from Henry IV. Verdi wrote two other operas based on Shakespeare plays – Macbeth and Otello. 2. Falstaff was the last opera written by Verdi when he was 80 years old. 3. Out of Verdi’s 26 operas – only 2, including Falstaff, were comedies. 4. Another operatic version of Falstaff was written before Verdi’s opera, by the Viennese classical composer Antonio Salieri (1750-1825). 5. Elgar composed an orchestral work titled Falstaff – Symphonic Study based on the character of Falstaff.